How do I load originals in the input tray? You can load originals that meet the document specifications in the input tray. Do not load photos, or valuable original documents or artwork, directly into the input tray. This may wrinkle or damage the original. Load these originals using an optional carrier sheet. The steps below describe loading originals of the same size. To load originals of multiple sizes at once, see the link at the end of these steps. Open the input tray and pull up its extension. Pull out the output tray and its extension, and open the stopper. Note: If you are loading an original that is 15.5 inches (393.8 mm) or longer, do not pull out the input or output tray extensions and do not open the stopper. Slide the input tray edge guides all the way out. If you are loading a multi-page original, fan your stack of originals. Note: If you are loading an original that is 15.5 inches (393.8 mm) or longer, load only one sheet at a time. 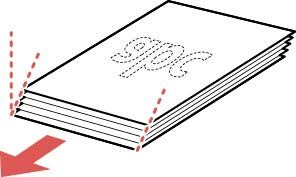 Stack the originals with the printed side facing down and slide the stack so the leading edge is at an angle as shown. Load standard originals into the input tray printed side down and top edge first, and guide them in until they meet resistance. 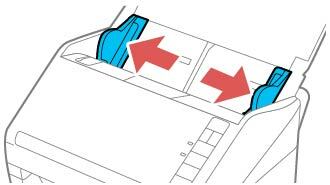 If you are loading paper business cards, load up to 15 cards printed side down and long edge first into the input tray horizontally, and slide them in until they meet resistance. 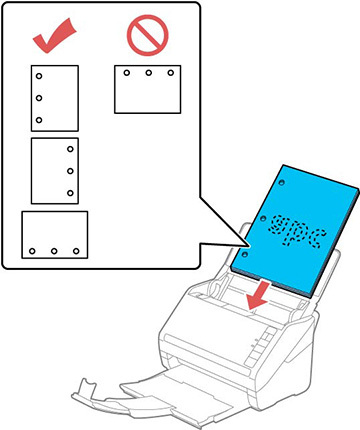 If you are loading hole-punched originals, load them with the holes facing down or to the side as shown. The holes must be within 1.2 inches (30 mm) of the edge of the originals. Slide the edge guides against the edges of the original. Note: If you are scanning originals that are 15.5 inches (393.8 mm) or longer, support the original as it enters into and ejects from the scanner as shown. 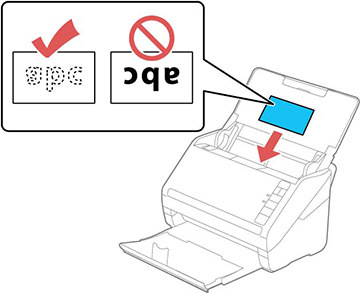 If necessary during scanning, adjust the position of the stopper on the output tray extension to fit the ejected originals. 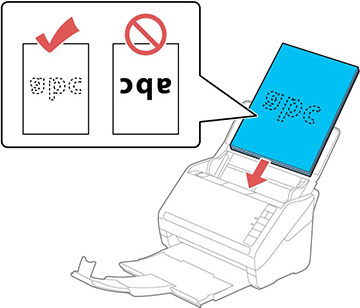 Note: If thicker paper does not eject properly or falls from the output tray, push in the output tray and allow the originals to eject freely onto the surface below the scanner. 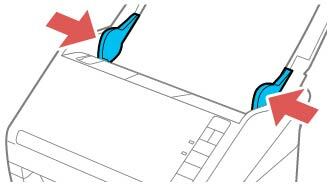 If the scanned images are affected by the originals ejecting below the scanner, try placing the scanner on the edge of a table where the ejected originals can drop freely. 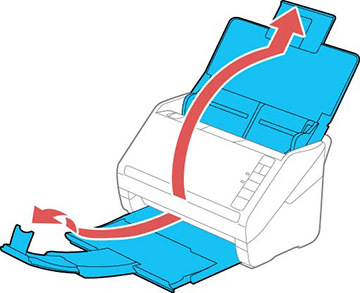 If scanning thin or wrinkled paper causes paper jams, press the slow mode button once before scanning to slow down the feeding speed; press it again to return to normal speed.